Well, that worked out rather splendidly. This has to be the first time I've seriously played Warmaster in at least a decade. Thanks to Dave for dusting off his old bones and pulling them out of retirement, we had a few others join us and take some of the commands. Phil, a new guy to our club (as of today in fact, and I hope he enjoyed himself enough to come back) joined Dave, and Rob, another diehard of classic GW games joined me in a 2000pt Undead vs. Undead ultimate showdown! OK, it wasn't the ultimate showdown, but it was so much fun. 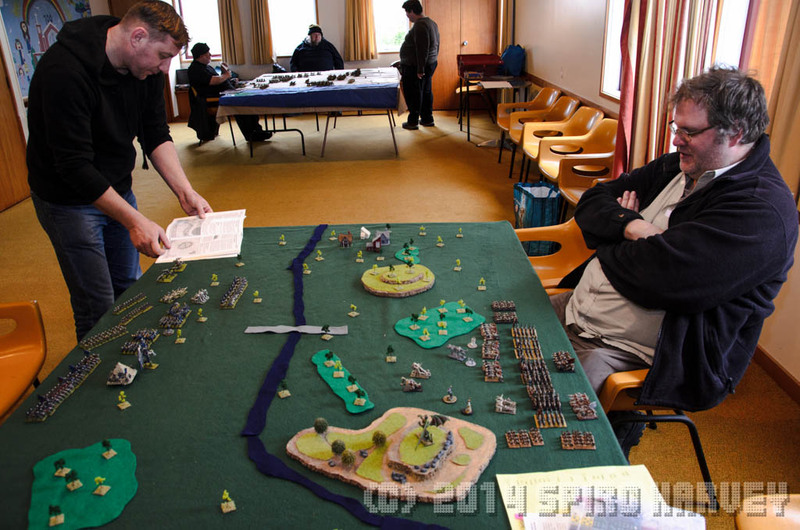 Warmaster has always been my favourite GW wargame ever, and in the years since, I was worried that I had changed my preferences in gaming styles. 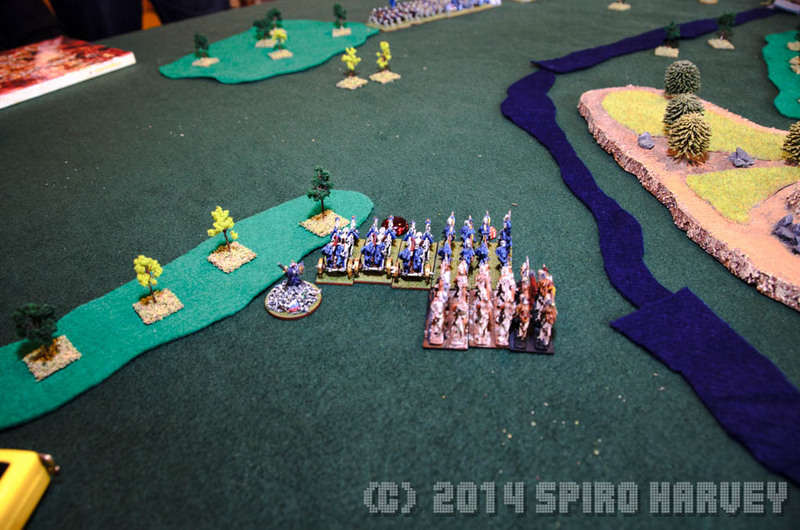 We ended up playing the scenario The Battle of the Little Big Bash, which was written around Empire attacking Orc defenders, but hey, maybe we were their dead, resurrected years later to do battle once more in the afterlife. 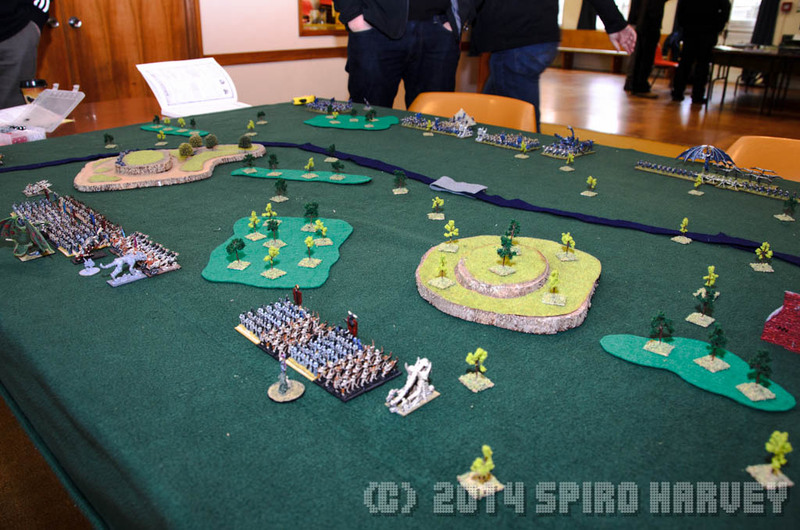 The scenario had a river breaking up the middle of the table, with one bridge for the attackers to cross. I played the defenders, and Dave the attackers. 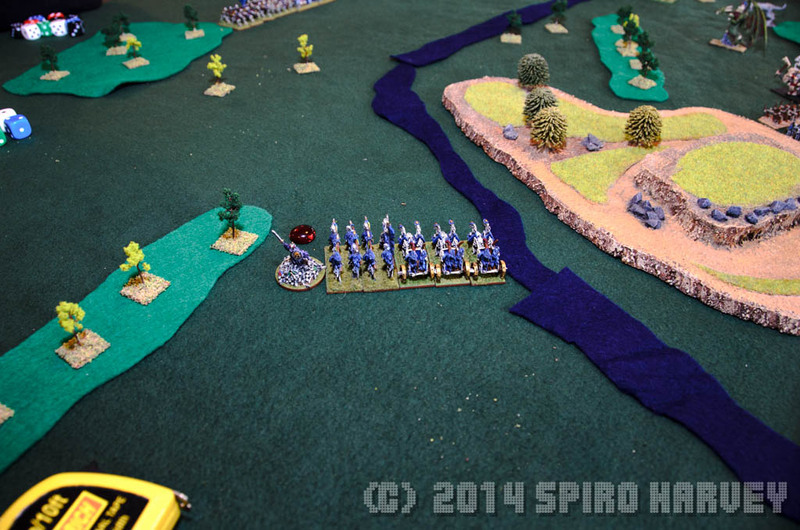 The idea was that I had to stop his units getting to my side of the river. We rolled up a 7 turn game, but only got through 3.5 turns before we called it a day and I conceded to him. Mind you, now that I think about it, we completely forgot to count casualties and determine breakpoints, so it's possible the game wouldn't have lasted much longer anyway. Yeah, we forgot most of the rules, but that didn't detract from the enjoyment in any way. A few more games and finishing a re-read of the rules will certainly help. And I'm quite keen to play again. Ultimately, what made it really easy for Dave to win, was his flying units. All he had to do was fly them over the river, keep them out of range of my bows, artillery, and spells, and he was good to go. Here are some pictures. The guy on the left is Dave, and the guy on the right is Grant. Grant was there for moral support and to laugh at whoever was losing that turn. The guys in the background are playing DBMM. 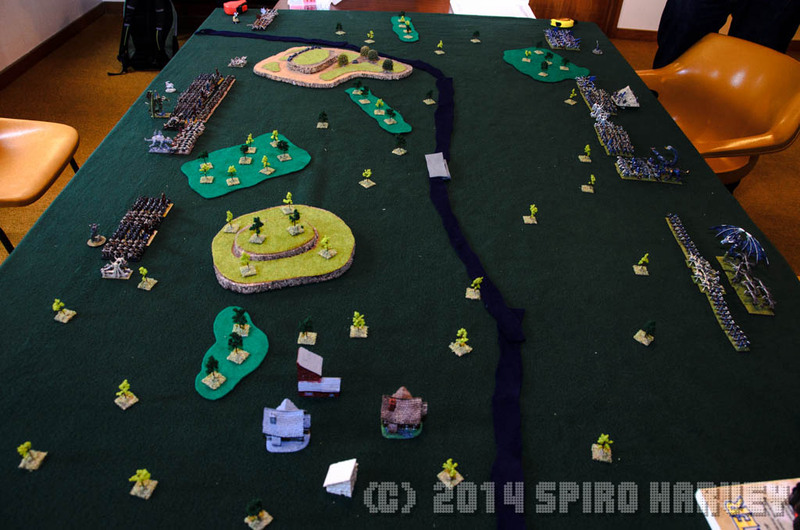 The table layout, river in the middle, and without a model of a bridge, we used a small piece of road instead. The view of the table from my corner. 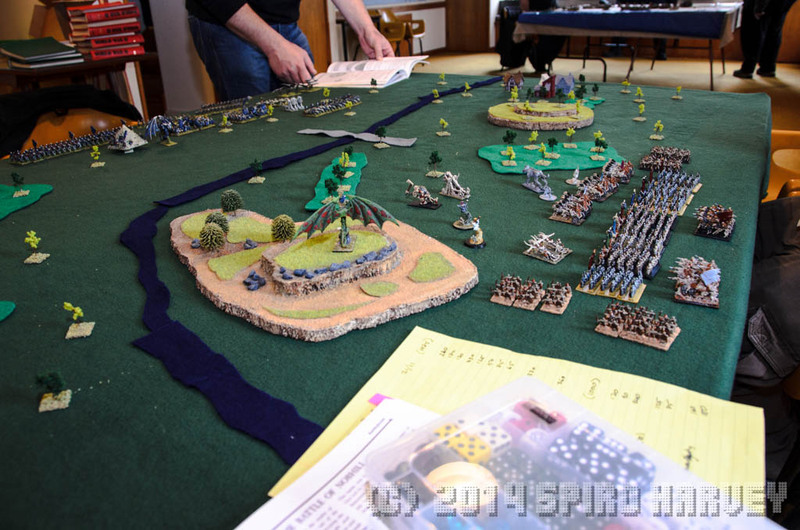 This is pre-deployment, and is just our models on the table while were figuring out what we had to do for the scenario. Post deployment. Defenders (me) on the left, and attackers (Dave) on the right. And we're just about to start. Only by now it's lunch time, so we step out to feed our faces. Much later (I forgot the camera in the car while we were out at lunch), things started happening. 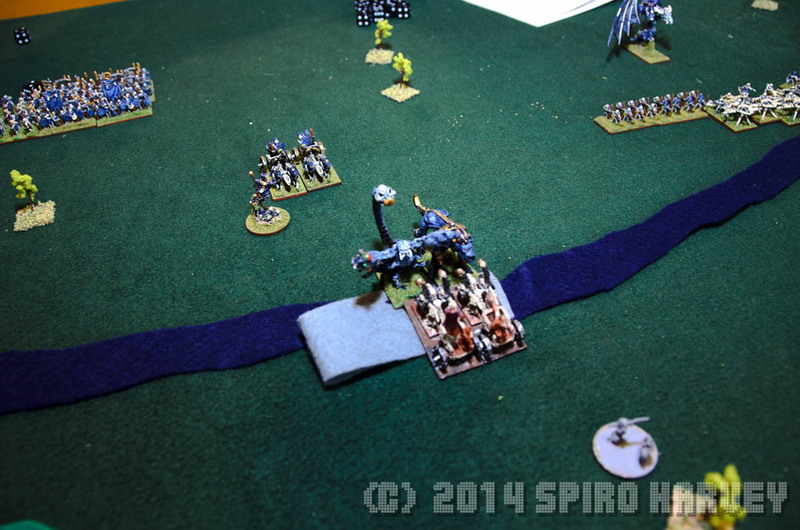 Dave here is moving up his two Sphinxes in the battle of the bridge. 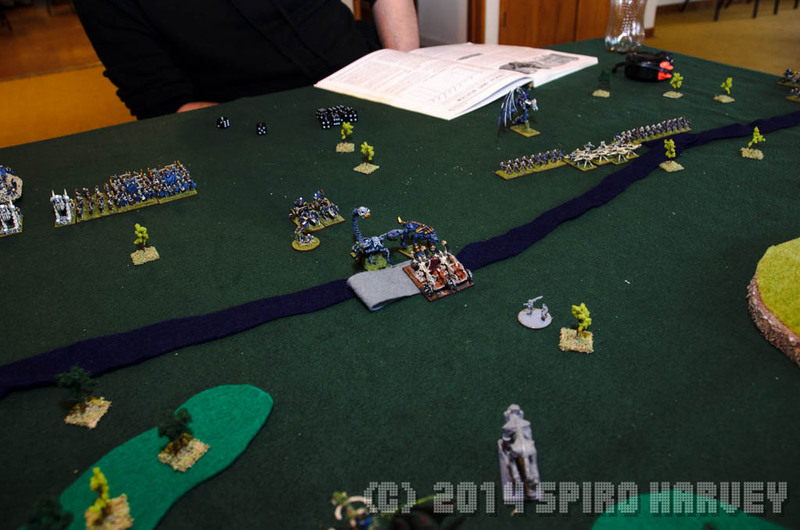 Initially, Dave had moved up two units of chariots fronting the two Sphinxes, and they held the bridge. 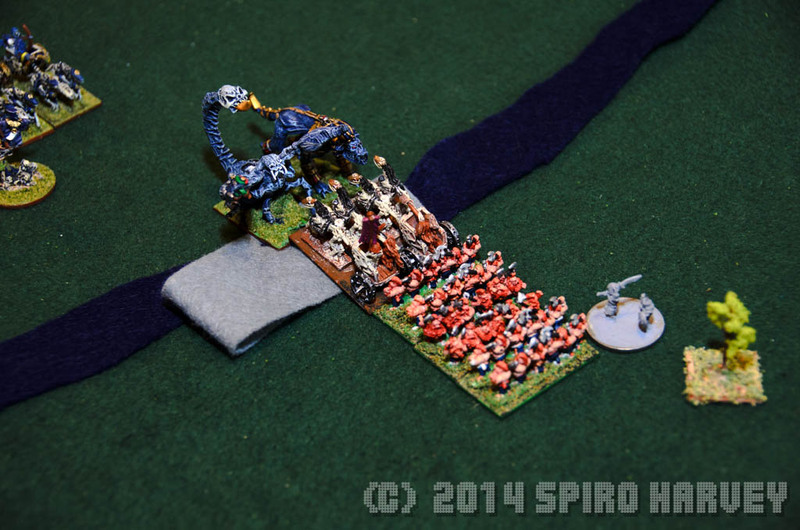 I moved up and charged their chariots with two of my own chariot units. I'm pretty sure we messed up the fallbacks, but how it played out was I completely destroyed his first unit of chariots in the charge. Then I advanced into his second chariot unit, causing them to lose a stand, and they fell back too, moving past the Sphinxes. 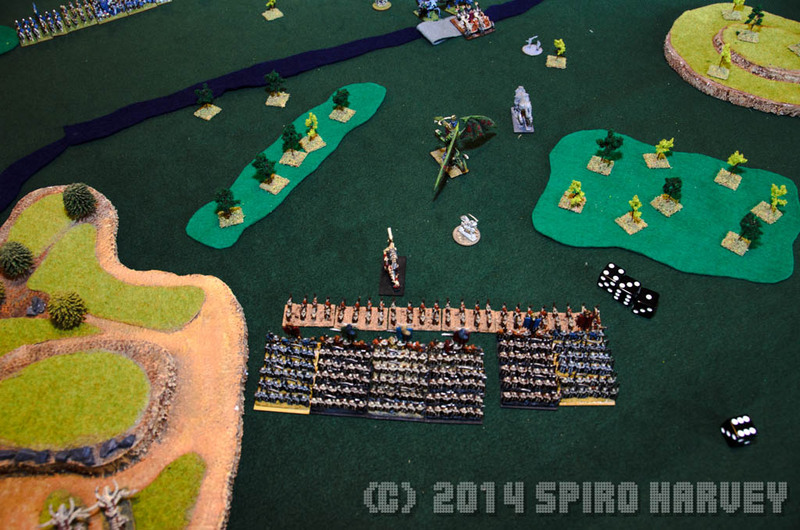 By this time, I was down to one stand from one chariot unit, and two stands from the other. From memory, I think I advanced into his Sphinxes. Which turned out to hurt quite a bit, as you'll see soon. At this point, I'm left with two chariots, and am about to be ground into dust. My bowmen and infantry start moving up. Surely I can help. My Bone Giant doesn't do a heck of a lot at this point, seemingly not being able to interpret his orders, so just stood there like a wet gumboot. ...because Dave raised some skeletons right behind me. Now your eyes may be playing tricks on you, and those skeletons might look like Troll Slayer Dwarves, but this is only a temporary hallucination because we had no spare infantry figures. ...and he completely wiped me out. However, as he was moving back to rejoin the rest of his force, I got my bolt throwers onto the hill on the right, along with a Lichee Priest, and managed to do a little bit more damage. OK, so I just scratched some of the paint on his chariots. 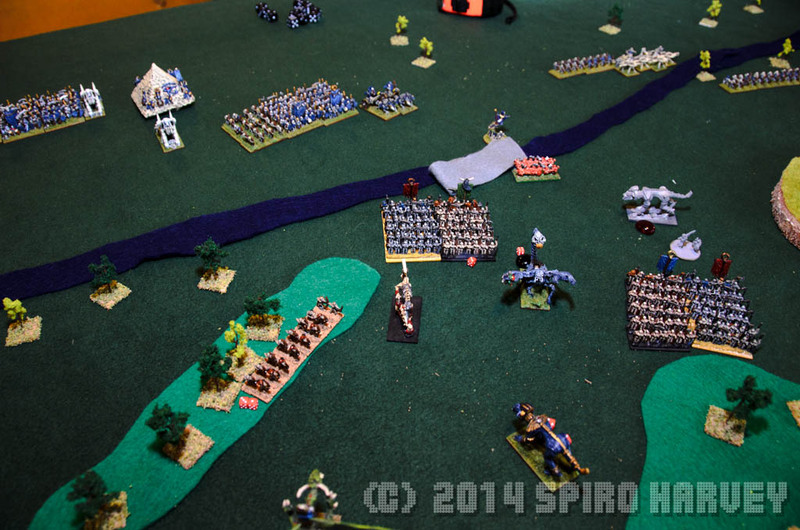 These are just a couple of shots after the game to show what the battlefield looked like. At the end of the day, it was completely irrelevant that I had no hope of winning before we started. And it didn't matter that we got most of the rules wrong, or figured out or remembered things part way through. What matters is that we finally got back into it, and we had so much fun that it won't be hard to twist anyone's arm into playing again. We will probably stick with smaller games while we're re-learning the rules, but it was so good to play again. I can put my hand on my heart and say that Warmaster is still my favourite game GW has ever produced. 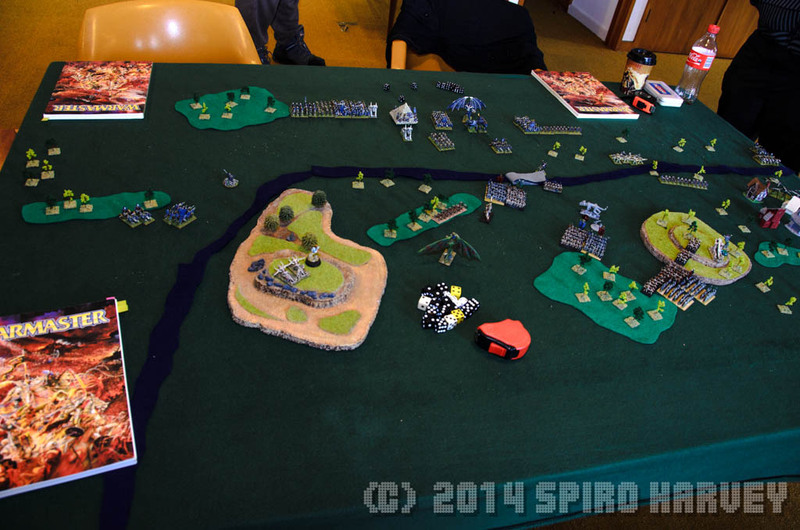 Nice to see some Warmaster played on NZ shores! It is indeed a cracking little game... I am sure I can dust off my orcs and elves for a game - though must admit i'd be pretty rusty with the rules too - havent played for years! Because of the elections on the 20th, Warlords won't be on for another month, so that'll give me plenty of time to go over the rules and soak them in again. If we don't get any games in at my place in the mean time, that'll probably be the next one. Which, of course, will also give me time to do more painting.